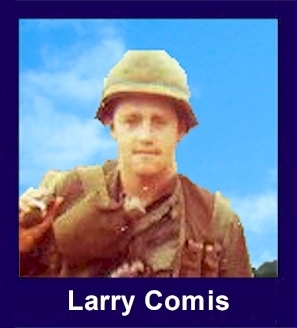 The 35th Infantry Regiment Association salutes our fallen brother, PFC Larry Melvin Comis, who died in the service of his country on March 24th, 1970 in Binh Dinh Province, Vietnam. The cause of death was listed as Small Arms/AW. At the time of his death Larry was 20 years of age. He was from Garden City, Michigan. Larry is honored on the Vietnam Veterans Memorial at Panel 12W, Line 37. The decorations earned by PFC Larry Melvin Comis include: the Combat Infantryman Badge, the Bronze Star with V, the Purple Heart, the National Defense Service Medal, the Vietnam Service Medal, the Vietnam Campaign Medal and the Vietnam Cross of Gallantry with Palm Unit Citation. I served with Larry, during his tour, in Vietnam. He was, a remarkable, human being. If I had, to choose two, words, to describe him, they would be, "kind" and "gentle." He lived and died, for his brothers. I recall especially, his friendship, with Tran Van Thieu, our Kit Carson scout. Thieu was a man, without a country. He had been, a Vietcong sergeant, but had, a disagreement, with a North, Vietnamese officer, who, then attempted, to take Thieu's life. Thieu came over, to our side. Larry sensed, his sadness and his need, for friendship. In fact, I believe, Larry wanted to find a way, to get Thieu, into the U.S.. This was typical of Larry, a man with a big heart, loved by all, trusted and respected. He must have, had wonderful parents. I will, never forget him and neither will, the others who served, with him. I'm sure he and Thieu, are happily together, again. Thieu was killed, shortly, after Larry. For heroism in connection with military operations against an armed hostile force in the Republic of Vietnam. Private First Class Comis distinguished himself while serving as a Pointman with Company B, 2/35th Infantry. On 24 March 1970, as the third platoon of Company B moved through rough terrain, Private First Class Comis noticed signs of recent enemy activity. After halting the remainder of his element and alerting them of possible danger ahead, Private First Class Comis cautiously moved into a depressed area. When he started up the other side, an estimated squad-size enemy force commenced firing. With complete disregard for his personal safety, Private First Class Comis remained in his exposed position to return a heavy volume of fire enabling his comrades to find cover. Seeing that his platoon found concealment, Private First Class Comis was seeking cover when he was mortally wounded. Through the sacrifice of his life, Private First Class Comis prevented the wounding or death of any of his comrades and was directly responsible for the routing of the enemy. Private First Class Comis' extreme courage, selfless actions, and exemplary devotion to duty are in keeping with the highest traditions of the military service and reflect great upon himself, his unit, and the United States Army.